Space permitting, you need at least 40 cubic feet for your pond—about 7 feet by 4 feet—to keep the water clean. An initial shallow terrace just inside the perimeter of the pond holds rocks that conceal the liner edge and keep it in place. A second, deeper terrace supports plants that live in the water and help balance the pond’s ecosystem. As you dig, you must slope the sides of the pond so that if the water freezes, the ice will push up instead of against the liner. Even in warmer climates, small ponds can change temperature rapidly, so if you’re adding fish you’ll want a deeper pond that will maintain a more consistent temperature and accommodate the fish—18 to 24 inches for goldfish and at least 3 feet for koi. To maintain the consistent depth of the water, you need to line the pond. A thin layer of sand and old newspapers or burlap bags softens the jagged edges of rocks and roots. But over that you will need to put a waterproof skin. There are several types of flexible liners meant for small ponds—made from polypropylene and EPDM, among other materials. Look for one that’s weather-resistant, so it will stand up to UV rays and freezing temperatures. It should also be rated “fish-safe” if you plan to stock your pond and come with a warranty of 10 to 20 years so your pond will be watertight for many years to come. Lay out the size and shape of your pond with a rope or garden hose. Using a spade, dig down 3 inches in a 1-foot-wide ring outside the outline to create the stone-border shelf. Next, create a plant terrace by digging a 1-foot-wide shelf 8 inches deep inside the rope outline. Only dig the terrace in areas where you plan to put plants. Continue digging inside the plant terrace to make the bed of the pond—a minimum of 18 inches deep, with a slight slope. #2 – Shape and Size After you determine your ideal pond location, the next thing to do is to layout your pond. 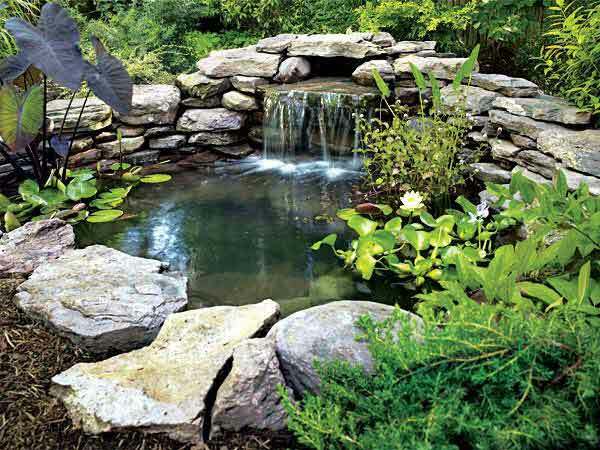 Ponds come in a variety of sizes, anywhere from tens, hundreds, or even thousands of gallons. 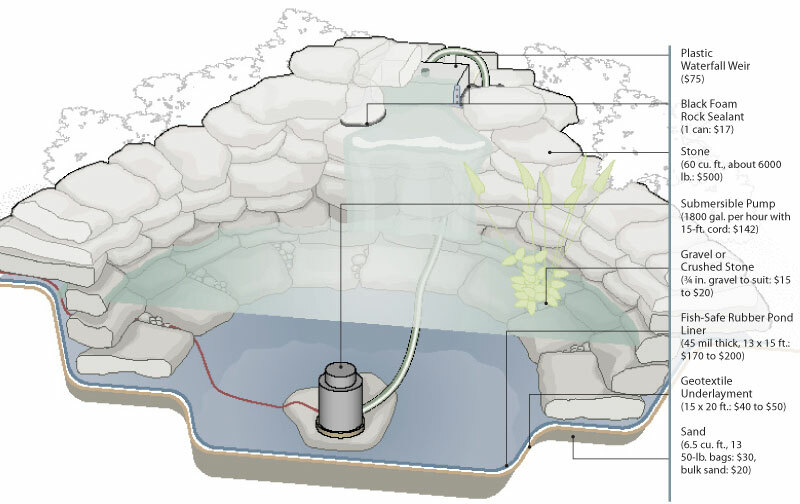 But, the most crucial consideration for designing a pond is its chemical stability and temperature. Water stability is directly proportional to the pond size. Therefore, the larger the pond is, the more stable the water temperature and chemistry becomes. This is due to the fact that pH (potential hydrogen) and temperature changes take place more gradually in large volumes of water. Now you might ask, what is the ideal pond size? Well it actually depends on your preference. Most successful pond owners go for a few hundreds of gallons. However, if you wish to have thriving species of plants and fish, then you could go for a larger pond. You might want to consult your landscaping company for help regarding the appropriate size, shape and depth that would meet your needs. #3 – Water Quality In order to sustain life forms in your pond, you also need to consider water quality. It is normal to have water attributes change, but it must occur gradually and not instantly. Abrupt changes in water parameters are the leading cause of poor pond health causing plant and animal deaths. Your water’s chemical and physical attributes must be taken into account and be monitored constantly especially if you have a newly built pond. #4 – Plants Plants play a vital role in any pond. It makes garden ponds look attractive and natural, and serves as breeding sites for fish. Water plants also help regulate temperature and help cleanse out nutrients that may pollute the water. The following are the common types of water plants that you may employ in your garden pond. 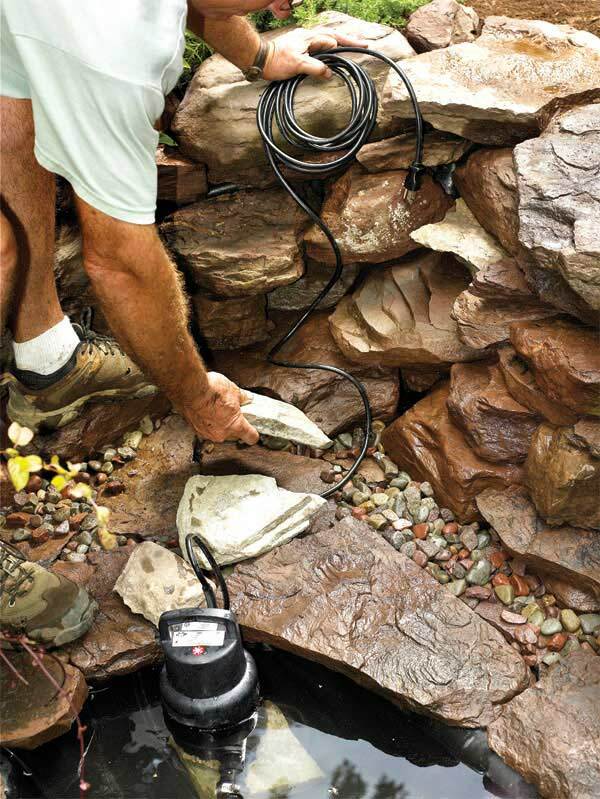 #5 – Maintenance The most common problem that is encountered by pond owners is green water. This is caused by an overabundance of free-floating algae consuming plant nutrients. There are certain methods that one could employ to resolve cases of green water. 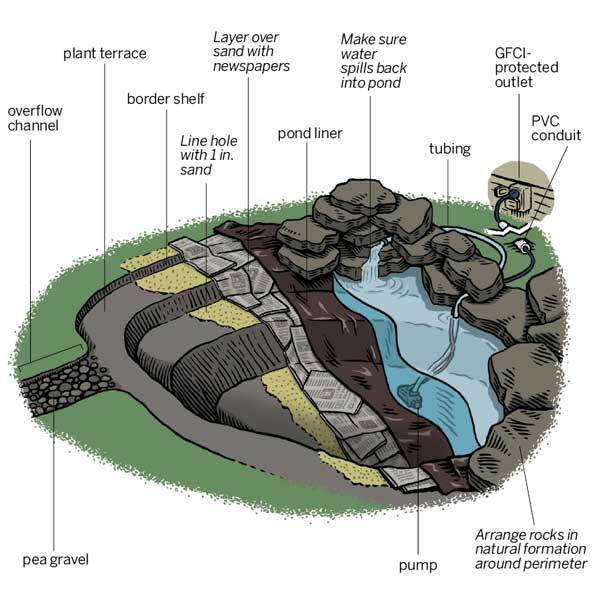 Although there are many natural ways such as the addition of aquatic plants, netting and water change, the most effective solution often employed by pond owners is the application of filtration methods. If you are unsure as to what filtration methods to use, you may seek help from your trusted local landscaping company. If you consider installing a garden pond in your yard, it might be best to work with a landscaping company to ensure that it is built to cater your needs. For a helpful article check out these suggestions from Popular Mechanics. To call us for a consolation regarding adding a pond to your property, dial (301) 533.0111.